The checkered past of Capt. Jack Sparrow (Johnny Depp) catches up to him when he encounters Angelica (Penélope Cruz), a beautiful pirate that Jack once loved then left. 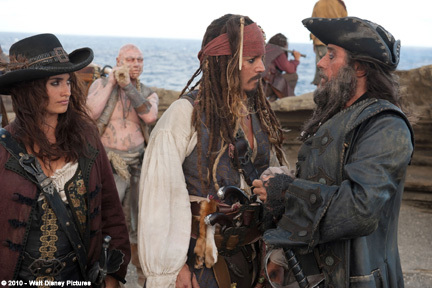 Angelica forces him to accompany her to the Queen Annes Revenge, the ship of the notorious Blackbeard (Ian McShane). Accompanied by a zombie crew, the trio sets sail to find the legendary Fountain of Youth. However, Jacks rival, Barbossa (Geoffrey Rush), also seeks the fountain, as does a ship from Spain.